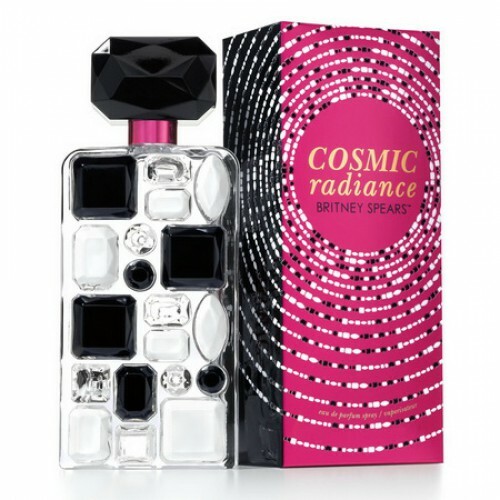 Britney Spears Cosmic Radiance 100ml. Eau De Parfum is a completely new perfume which arrives on the market in 2011, in a bottle with the same design as last year's Radiance. Created of black and glittery transparent surfaces reminiscent of gems, a small dose of elegance and femininity is added by the pink color on the neck of the bottle. Cosmic Radiance is infused with a splash of succulent citrus and luscious fruits that surround a bouquet of dazzling white flowers. Sultry notes of amber, sandalwood, and liquid vanilla emerge from the back, for a curvaceously feminine impression. The fragrance can be expected with the launch of a new remix album by Britney Spears. "Be the brightest star of the universe!“ says Britney. The fragrance will be launched under the license of Elizabeth Arden. Cosmic Radiance was created by Honorine Blanc and Harry Fremont. A new variation on the theme of Radiance released under the brand name Britney Spears in 2011. Fresh fruit and flower arrangement Cosmic Radiance has a bright and optimistic character. Juicy fruit merge into a harmonious bouquet with delicate sweetness of flowers, creating the effect of twinkling stars. Fragrance Cosmic Radiance invariably draws attention to its owner, emphasizing its charm and charm, making it shine throughout the feminine beauty. The original design of the bottle and the shimmering lights on the package as accurately convey the essence of flavor. Top notes of the fragrance Cosmic Radiance is made ​​up of sound optimistic lychee and mandarin with juicy, fragrant pears. The gentle sweetness of flowers surrounds the heart captivating fragrance of fresh haze. In a magnificent bouquet of aromas intertwined royal tuberose and jasmine, peony and gardenia gentle. Warm sound of vanilla and amber elegantly decorated train of noble chords of sandalwood and musk.